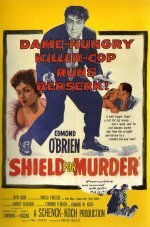 Edmond O'Brien co-directed and starred in this meaty drama of a city cop "gone sour", a veteran of the force who hankers after the good life in suburbia. Killing a crook for the loot he's carrying, the cop then tries to deal with the complications: a witness to the murder, a gangster who wants his money back, and his betrayal of John Agar's young detective who has always looked up to him. O'Brien's sweaty performance is better than his uneven direction, but there are tense moments and the climax on the front lawn of the cop's dream home is typically forceful.